Sale of Work, Marton, Blackpool. Marton Moss 1920s press cutting. 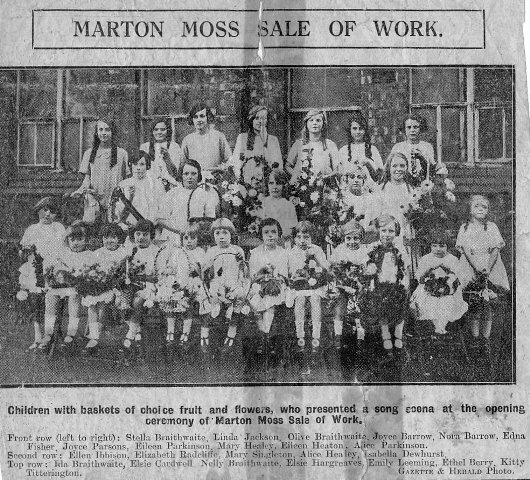 Children with baskets of choice fruit & flowers, who presented a song scena at the opening ceremony of Marton Moss Sale of Work. Front row (left to right): Stella Braithwaite, Linda Jackson, Olive Braithwaite, Joyce Barrow, Nora Barrow, Edna fisher, Joyce Parsons, Eileen Parkinson, Mary Healey, Eileen Heaton, Alice Parkinson. Second row: Ellen Ibbison, Elizabeth Radcliffe, Mary Singleton, Alice Healey, Isabella Dewhurst. Top row: Ida Braithwaite, Elsie Cardwell, Nelly Braithwaite, Elsie Hargreaves, Emily Leeming, Ethel Berry, Kitty Titterington. Farm & sawmill, Marton, 1956.